In the last article, we discussed some of the elements of album cover art and I would like to continue the discussion with some more details and an album cover finder that is a must for any fan of album cover art. As I stated previously, many famous artists have been commissioned to design and produce album covers. For example, the Rolling Stones and pop artist Andy Warhol are famous for the cover art on the Stones’ album “Sticky Fingers.” As the story goes, at a party in 1969, Andy Warhol casually mentioned to Mick Jagger that it would be amusing to have a real zipper on an album cover. A year later, Jagger proposed the idea for “Sticky Fingers.” But, there was a flaw in the shipping process, the zipper would press onto the album stacked on top of it, causing damage to the vinyl record. The solution? The zipper had to be pulled down before the album was shipped, then it would only dent the album covers. However, they never figured out how to keep the zipper from scratching the other album covers. Additionally, some department stores refused to display the album, feeling it was risque and not family oriented because of the model’s snug jeans and the zipper display. But this album is historic because it broke new ground and also saw the debut of the now famous Stones logo: a caricature of Jagger’s lips and tongue. If you are a Janis Joplin fan, then you would probably know that the famed cartoonist Robert Crumb designed the cover for Joplin’s album “Cheap Thrills.” This revered, yet misunderstood artist, drew the cover as a favor to Joplin, who he befriended in the Haight-Ashbury neighborhood where they both resided. He was paid $600 for his work by Columbia Records, which later sold the artwork. Crumb was asked to do a cover for the Rolling Stones, but refused because he did not like their music. Crumb is also the artist for the “Keep On Truckin’” poster and “Fritz The Cat,” and has more than seventy covers to his credit. The Internet is full of sites related to album cover art and is just too numerous to list. There are sites devoted to fan favorites, the weird and unusual, particular decades and so on. Many users have turned to ebay to find lost art treasures from their childhood. But I want to share a website and album cover artwork finder that is not only convenient, but a must have for any art lover. I recently spoke with Richard Nicol, the program designer and owner of “Album Cover Finder.” (http://www.albumcoverfinder.com) The program has been available for more than two years and is a godsend for anyone interested in album cover art. “Album Cover Finder” allows the user to not only find specific searches for interesting album cover art, but also allows the user to download selected songs from the release. I asked Richard about his fascination with album cover art. But “Album Cover Finder” is more than just iTunes and album cover art. The program allows users to look at different art work from different countries as well. Some of the art work involved in a US release may be different from that of a UK release or German release, only adding to the experience. The program also allows users to review artist biographies, read reviews of a particular release and add the artwork to their iTunes library and an iPod. “Album Cover Finder” also allows users to find additional cover art from a particular artist or band, copy the artwork to a clipboard and has artist videos and applicable tour information. “Album Cover Finder” is a fully functional way to search for album artwork and includes free updates for registered users and is available at http://www.albumcoverfinder.com. Now, I have only had the program about a week, but I have to admit spending literally many, many hours looking at historic artwork and listening to the songs associated with the acts. This software gets a hardy “thumbs-up” and is a “must have,” affordable program for album cover art connoisseurs and anyone with a fascination with art and music. Needless to say, there can be a lot more written about album cover art and the impact it has had upon music and pop culture and cannot be summarized in a couple of articles. There are countless books, (I actually own one that talks about and illustrates naked vinyl and the images used to try and sell albums!) that detail album covers and the impact upon pop culture and music. Additionally, there are so many web sites and blogs associated with album cover art, they are to numerous to list. Why there are even web sites devoted to preserving this treasured art and frame it for display. 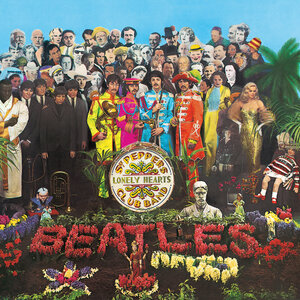 Furthermore, did you know that June 1, 2007 marked the 40th anniversary of the release of the Beatles’ “Sgt. Pepper’s Lonely Hearts Club Band?” Not only is the release one of the most influential albums of all time musically, the cover art itself is iconic as well.